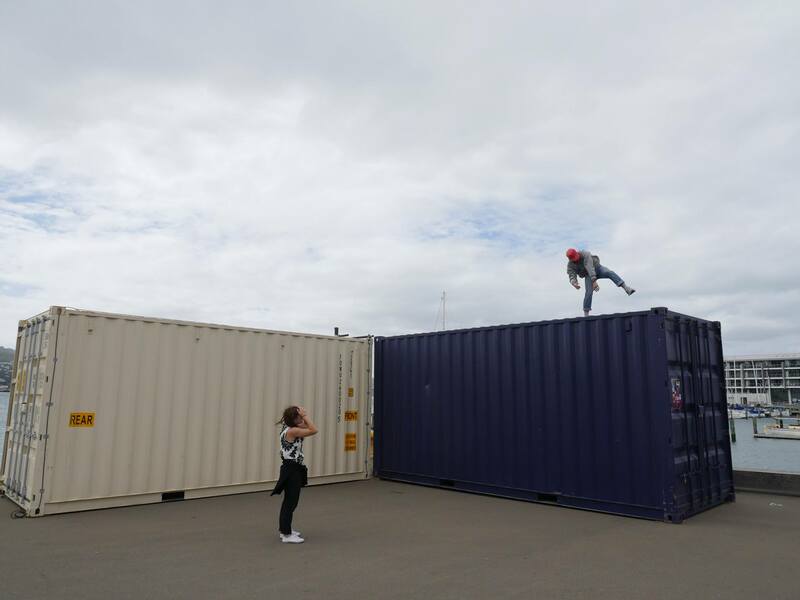 BodyCartography’s (NZ/USA) Olive Bieringa & Otto Ramstad share their project closer(solo) with the Wellington public, as a part of the waterfront’s temporary shipping container Performance Arcade 2016. A cohort of stunning performers: Kosta Bogoievski, Eliza Sanders, and Footnote NZ Dance’s ChoreoCo 2016 team, Veronica Butturini, Josh ‘Fale’ Faleatua, Sione Fataua, Paige Shand, Adam Naughton and Lydia Connolly-Hiatt, join them. The premise of the work is simple but not easy. Passers-by are given a chance to sign up for a one on one performance. One dancer and one audience member, both improvise. As they meet an inter-play of possible connections between the two unfolds, within a 15-minute timeframe. As I approach the opening event of this live art festival I am aware of dancers making shapes in my periphery. Upside-down bodies squashed next to concrete steps, and long-limbed lines spiking toward the sea. I do not give them my full attention but am astutely aware of the energetic pulse they add to the space and their tendency to disperse action and focus away from the hub of the container village. They make me feel out, not in. And ‘they’ are not only the bodies named above, but also the unknown, unpredictable bodies of the public. The one-on-one premise of this work has totally collapsed before I’ve even signed up for a dance. I am already a fuzzy-focused audience member and I am one of many. And the stars of the ‘show’ reach far beyond the assigned ‘dancers’, believe me, the ducks were working it. Whilst this collapsed notion of one to one, a false promise of sorts, foregrounds my doing/thinking, my three contracted experiences of closer(solo) absolutely highlight the need for this emphasis in the works design. I know him a little. We’ve danced together before, in performances and workshops. Olive informs me that I can follow as close or as far as I choose from Otto. His slight dramatic pause accentuates his hyper-colour watch and we’re off. His body is well versed in moulding, leveraging, sliding, scaling, seeking and sensing, with all that surrounds it and all it contains. There is a relaxed ease to his actions with no inclination to convince or entertain. I enjoy the simplicity of being the boss of my own frame as we traverse down stairs, across platforms, through people, into shrubs, up walls and through trees. I am hyper-aware of the potential that exists in my role as audience. I test out the distance and angles between us and register how those differing senses of space manifest in my body. I notice that when he is physically right there, that man that I know a little, I feel a great distance, today. I find this unsettling. This sense of distance from Otto amplified my sense of everything other than Otto. The shifts in volume of music and chatter, senses of heat, glimpses into others’ dramatic daily scenes, and the textures of our surrounds were all magnified. I was particularly sensitive to heat. A friction between our triceps generated intense localized warmth; shifting through shadow and light, surface glow; and physical excerption, a full body flush. I find it super interesting that in this instance, this practice of directed attention towards a ‘somebody’ made every other body louder. This performance of Closer(solo) was intercepted part way through by Otto’s daughter. She literally dived in! Things got funky. There were intimate roll on the ground cuddles that I was definitely not a part of. There was a tension in Otto as he attempted to encourage her out of our zone. I flash my sympathy eyes. My role shifts and feels more like tagging along in the periphery of someone else’s experience. But this rupture is of course one of the things that is so golden about performance art that is situated in open public spaces, the loosening of codes (social and theatrical) that allow for the unforeseeable to emerge. I saw her for the first time, a week prior, performing in a black box theatre. I knowingly break the rules and ask if I can do a trio with my 2 year old. Olive and Otto weren’t there. This meeting with Paige became an exercise in knowing what the work is not. This was a toddler-led trio, a negotiation between three. It sure was fun. It’s easy to be seduced by the impulses of a two-year-old. They liberate you to break the unspoken codes of public spaces and social exchanges. Thanks, toddlers. Paige was bursting with moves, flexible limbs flying this way and that. We had a playful bouncy exchange that worked its way in figures of 8 around poles, sculptures, containers and each other. Whilst joyfully impulsive, the busyness of this tri-focal dance encounter didn’t allow much room to tune. For me, the solo in closer(solo) became all the more imperative. Whilst there is so much potential for the dancer/audience roles of this work to blur and for audience and performers to become multiple, there is a sense of empowerment as the designated solo audience. The choice of how you ‘watch’ is totally yours. You are free to experiment with a new way of being audience. This freedom, for me, is diluted and/or complicated when in negotiation with other audience members. It’s market day on the waterfront. Perhaps the most ‘general public’ visit I make to the Performance Arcade. I meet Lydia and hear a repetition of the only words these dancers say to you: “You can follow as close or far to me as you like”. I immediately make bold moves. I’ve got my Sunday fun-day flow on. A call and response course of events blurt out. Our interaction is filled with fizz. Lydia is quick and decisive, and she has an ability to connect directly and pragmatically with her audience. This performance feels as though it is with and not for me. The closer we travel to the market, the more aware I become of other people. My perception of onlookers is that when they recognise ‘dance’, they relax with their gaze, happy to watch, intrigued. But when the performance deviates to actions that aren’t ‘normally’ everyday public occurrences, people actively avert their eyes, and there is a held containment in their bodies. At times I sense a parental protectiveness when kids are around, a ‘keep away from whatever that is’ vibe. I feel an empathetic urge to let people in on the script. For me, this dance with Lydia highlighted the tension between the intimacy of the one-on-one format and the overtly public nature of the work. I found closer(solo) to be, a socially engaged, thought-provoking, movement-making, sensational performance art work. As audience I am full of explosive unformed questions, and a knowledge that you could go back for infinity and new sensations would arise.